There was plenty of controversy in Man City’s 3-1 win over Arsenal on Sunday, while in the Championship Tyrone Mings was again at the centre of a ‘stamping’ furore, all in Ref Review. 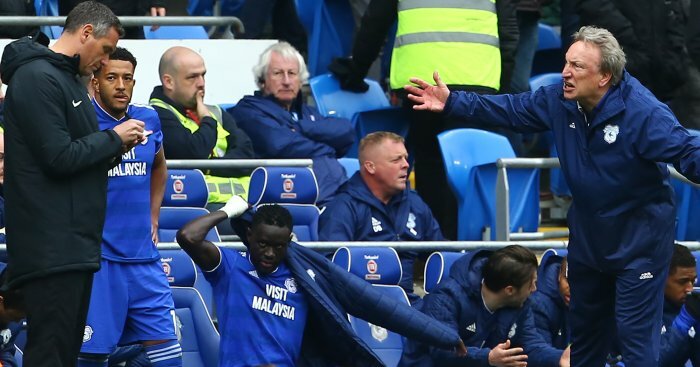 It’s going from bad to worse for poor old Marco Silva and the first goal from Saturday’s 3pm fixtures came courtesy of a spot kick awarded to Wolves at Goodison. Leighton Baines, who was struggling with a rib injury before kick-off and ultimately replaced after 37 minutes, tripped Matt Doherty in the box on seven minutes and it was an easy shout for ref Lee Mason. Field marshal Coady was immense again for Wolves but we feel the ex-Liverpool man was perhaps lucky not to be dismissed when he brought down Sigurdsson in the second half on the edge of the area. He was already on a booking at the time and if he didn’t intervene, illegally in our view, then Sigurdsson would have been through on goal. This happened in the Championship this weekend, but it’s worth documenting. Reading’s Nelson Oliveira was left with a nasty facial injury after he was allegedly stamped on by Aston Villa debutant Tyrone Mings. Oliveira was competing with Mings for the ball in the 73rd minute of the goalless draw when he he fell and the Villa man then stood on the head of the Reading man. The ref missed it and no action was taken, but deliberate or not it was surely violent conduct? It was at best clumsy from Mings who issued an apology to the Royals man. Judge for yourself. What is hard to ignore is that Mings has history with a similar incident when his foot made contact with Zlatan Ibrahimovic’s head during Bournemouth’s 1-1 draw with Manchester United in 2017. The FA will surely be looking into the matter further and their judgement could be swayed by the previous incident. Crazy, crazy stuff from Cyrus Christie, who punched a cross away in the area at Selhurst Park when under pressure from Christian Benteke. 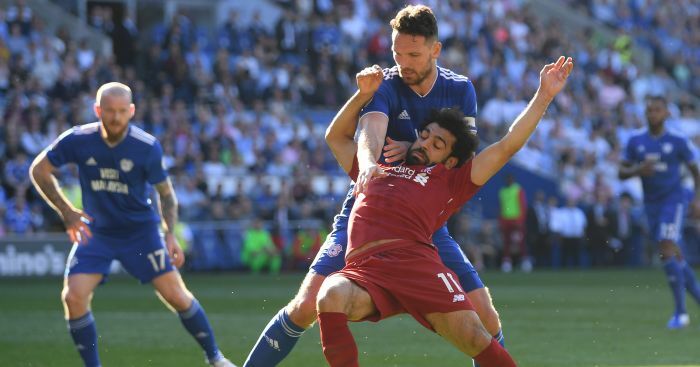 His hand should not have been there and it was a good spot from Michael Oliver and his team. A sickener this. Tomkins went up for a header, got sandwiched and slammed against the back of Mitrovic’s skull with his nose. 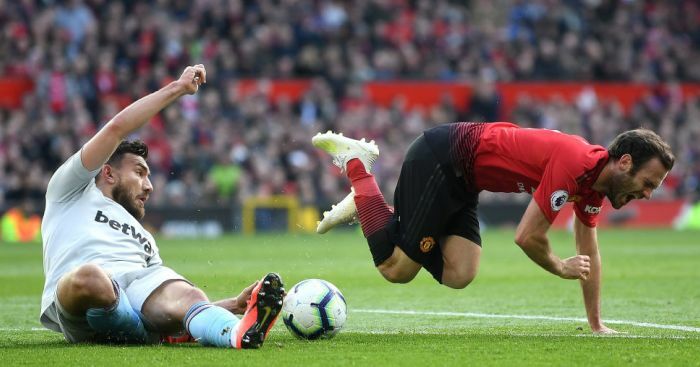 Claret everywhere, but it was just one of those unfortunate accidents with no blame attached to either party and Michael Oliver correctly called a halt to proceedings so the pair could get some treatment. The biggest talking point of that first half at Turf Moor was definitely the Barnes yellow for ‘diving’. It’s been well documented that Burnley don’t get many penalties and we reckon they were hard done by here as Alex McCarthy sent Barnes sprawling in the area. The Burnley man seemed to just get there before the ‘keeper so the decision to book him – whether that be for simulation or his explosive reaction afterwards – looked a bad one. They say a river cuts through a rock not because of its power, but its persistence. And Burnley in the end would not be denied at Turf Moor after relentlessly pumping balls into the box as the clock ticked away. 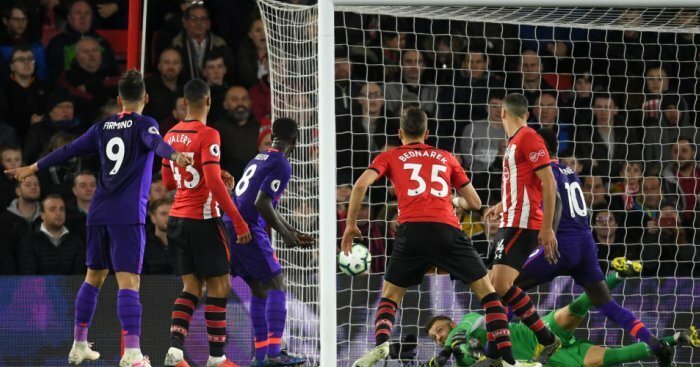 Right at the death their tactic was rewarded when Peter Crouch made a nuisance of himself in the area and Jack Stephens handled in the third minute of stoppage time. When leading 1-0 Cesar Azpilicueta ran from deep and Elias Kachunga gave him a nudge in the back and he went over. Our first thought was that the contact was just outside the box. There was a nudge and Azpilicueta lost his footing but it looked a genuinely soft award from Paul Tierney. Eden Hazard was later sent tumbling in the area by Tommy Smith but this time Mr Tierney said no. To be fair that looked like more of a penalty to us than the one they scored from. When you are down among the dead men, nothing much goes for you. 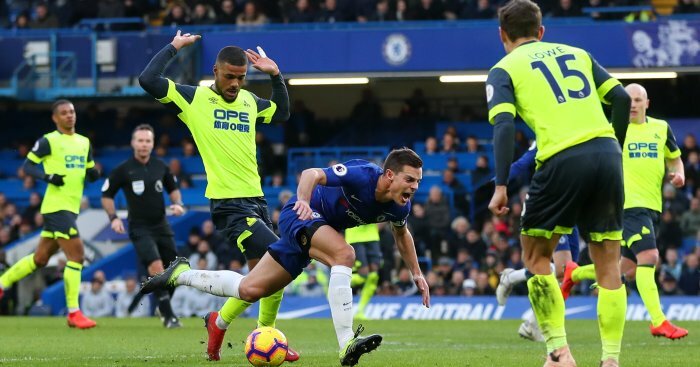 Huddersfield appealed for a penalty of their own as Kachunga raced into the box alongside Andreas Christensen. The duo both went for the ball and then Christensen appeared to then tangle with Kachunga, who eventually went down. The ref could see nothing wrong though and neither could we. Whistler Mike Dean handed out eight yellow cards in this match (four to Leicester, four to Man Utd). Only one Premier League game (Arsenal vs Huddersfield with nine in December) has seen more yellow cards brandished this season. 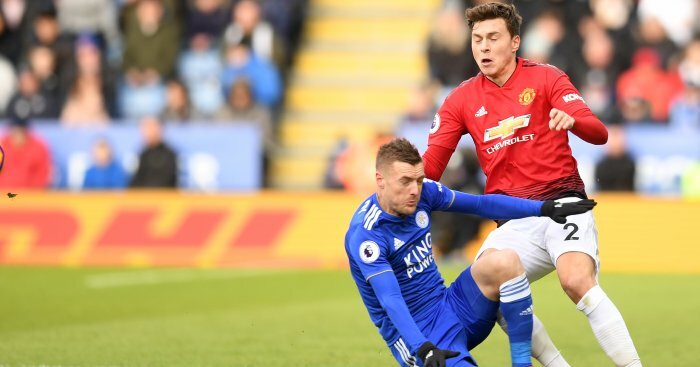 And the most blatant of them all was Vardy’s, whose frustration was clear for all to see as he absolutely wiped out Victor Lindelof near the halfway line. It was super reckless and a yellow all day long. 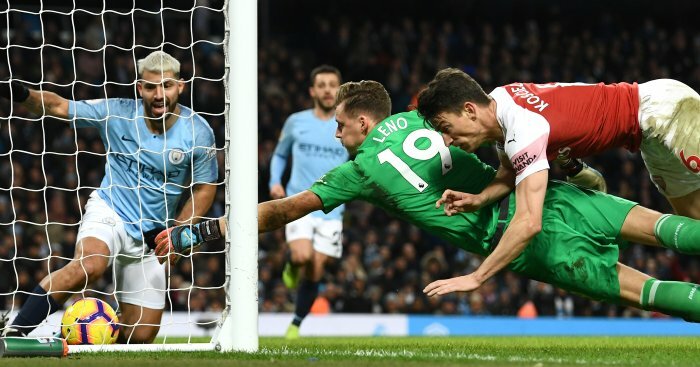 A lightening start from the champions on Sunday and Sergio Aguero really should have had a penalty and City the chance to go 2-0 up as Shkodran Mustafi pulled the striker down to the turf as he attempted to get onto a Kevin de Bruyne through ball. Seriously, how does neither Martin Atkinson nor his linesman see Mustafi pull down Aguero? That looked a penalty and a red card to us. To be fair even Aguero thought it had hit his arm but only after seeing footage. He clearly makes no arm movement towards the ball which is why I suspect the ref hasn't blown for hand ball. An Argentine scoring in a big game with his hand? Whatever next? 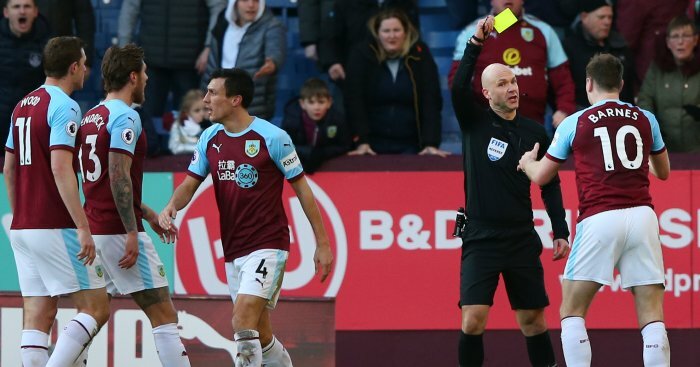 Barnes was apparently booked for screaming at the referee’s assistant when he was denied a penalty in the first half of his side’s 1-1 draw with Southampton at Turf Moor. And while we cannot condone his explosive reaction you can understand his frustration as he was denied what looked a clear penalty to us. With Burnley hovering just outside the relegation zone, how big will that call prove for the Clarets come the end of the season?